Mindful Echo gets swept away. A little while ago I was complaining to one of my nearest and dearest about my struggles to keep up with the never-ending mounds of fur that accumulate on my floors. The combination of cat and dog fur reveals itself in new piles MOMENTS after I've dusted, swept, mopped, or vacuumed. I turn around and it's there. ALL THE TIME. Guiltily I'll admit that I often succumb to the ease of disposable cloths, rags, and wipes in many of these cases. It hasn't been for lack of effort - my purchases of reusable devices have proven fruitless either by virtue of inferior product design, poor manufacturing, or ease of use. So, hearing my complaints, I was gifted with a no-more-excuses kit that will allow me to maintain my hardwood without piling on disposable purchases. 1. Fill the container with the water, vinegar, and soap. With some minimal effort on the front end, having these rags handy eliminates virtually any reason to go the disposable route. The best part is that the cloths actually fit perfectly as Swiffer wipes too. 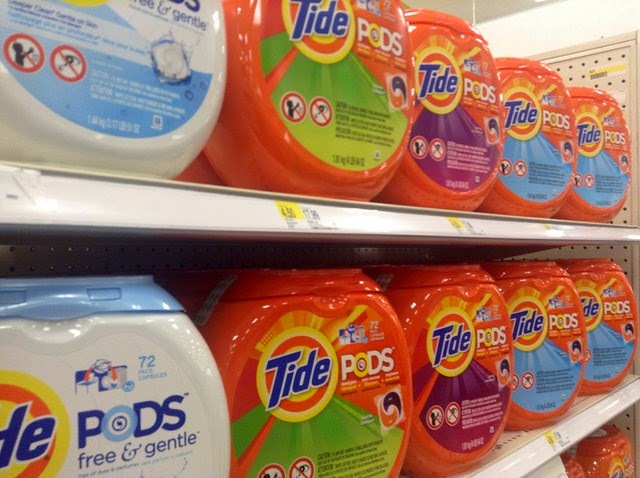 When the cloth is dirty, just toss it into the wash with the rest of your laundry. Replenish the vinegar/soap solution and cloths as needed. In my opinion, this is one of the best gifts I've ever received. A good friend empowers you to live the life you strive for. For me, it's about living gently upon the earth while NOT being covered in dog fur. But, you know, to each her own. Queen Composter hopes for cold season gardening success. 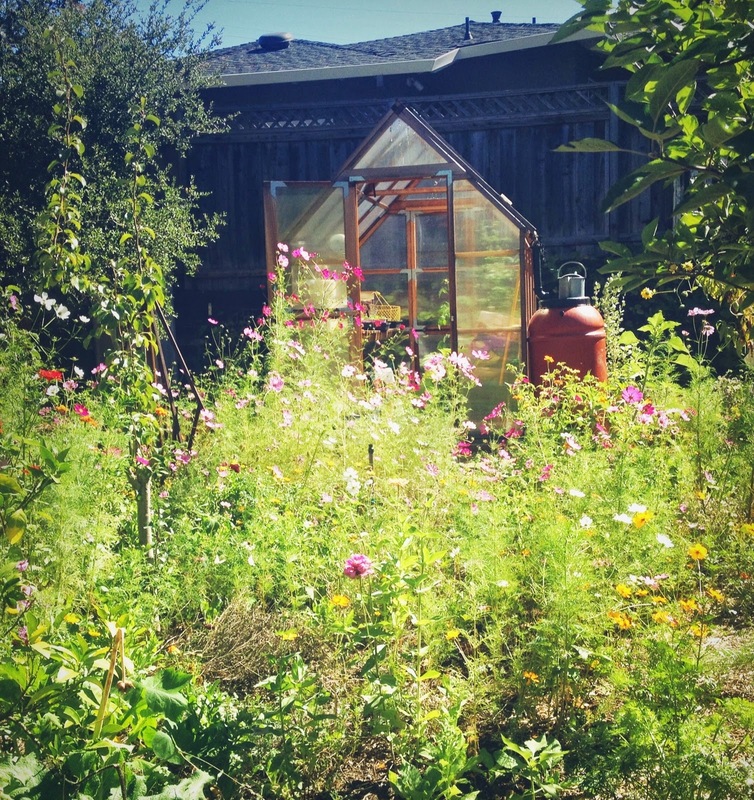 Last year I began experimenting with extending the growing season and harvesting fresh food through autumn. In fact, I was able to harvest backyard veggies for the last time on December 1st! After that we had an unseasonal cold snap and early snow (I live in the moderate pacific northwest where we are increasingly finishing winter with little to no snow). Luckily some of my cold resistant veggies bounced back enough by late winter that I could start harvesting them again in February and March. But one of my faults as a backyard gardener is that I often forget to harvest the veggies before they bolt (go to seed) in the summer or freeze in the winter. I'm always disappointed that I didn't pick something when I thought of it instead of waiting just that one more day or week. Hardy plants like kale did well with limited frosts and bounced back quickly, but my turnips, carrots, and cabbage were turned to mush in the freezing temps and never rebounded. 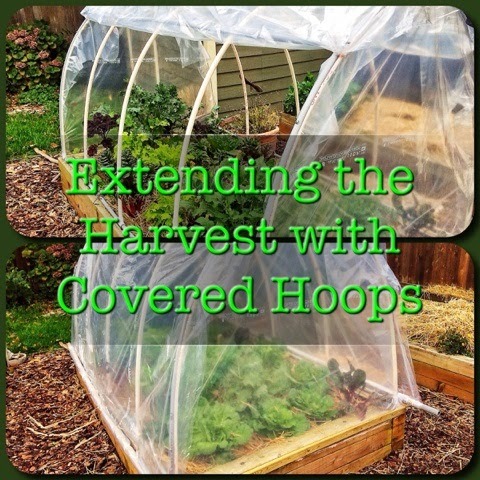 Through the summer, after doing more reading about fall and winter gardening, and weighing the pros and cons of cold frames versus covered hoops (an excellent discussion here), I decided to try covered hoops this year. 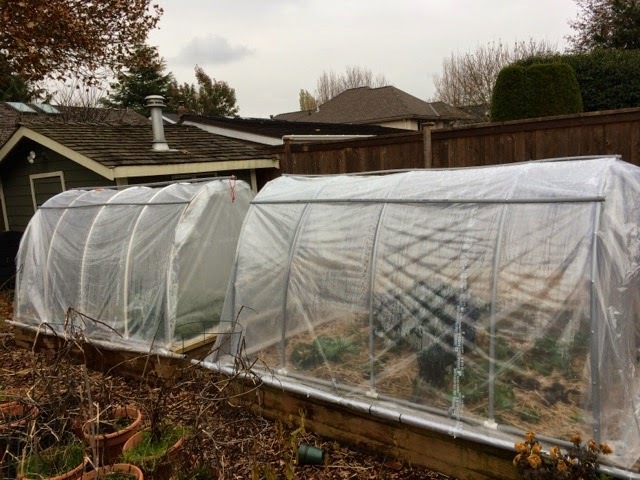 Sometimes plastic covered hoops made with flexible tubing are called low tunnels, and the taller variety are called poly tunnels. I guess mine are a hybrid (not low but not tall enough to walk in). My wonderful neighbour (really, he's amazing) built my covered hoops once I'd cleaned up the fall garden and mulched everything for warmth and moisture retention. Unfortunately we'd already had a frost, so there has been some damage to the lettuce and Asian greens, which I'd hoped to avoid. With the sides down for full protection. With the sides up for moisture in warmer temperatures. So how well do the covered hoops work to protect my plants? We've had about a week of below freezing temperatures (which came rather suddenly after unseasonably warm temperatures) and today I went outside to raise the sides to allow some rain in now that the forecast says warmer temps for the next while. 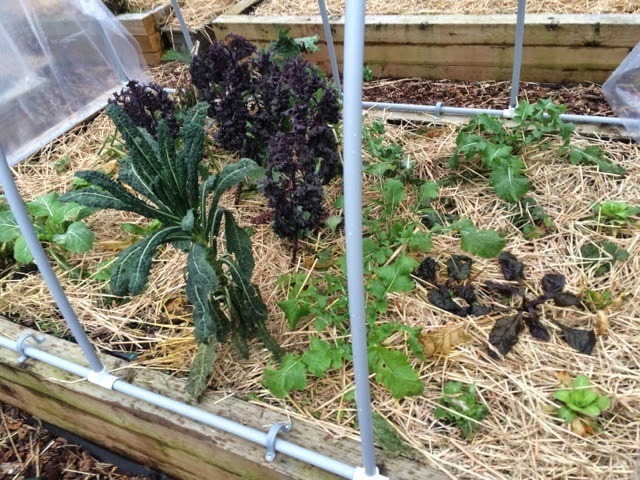 I was pleased to see that the kale is rebounding nicely (however, the uncovered kale is in the same condition). 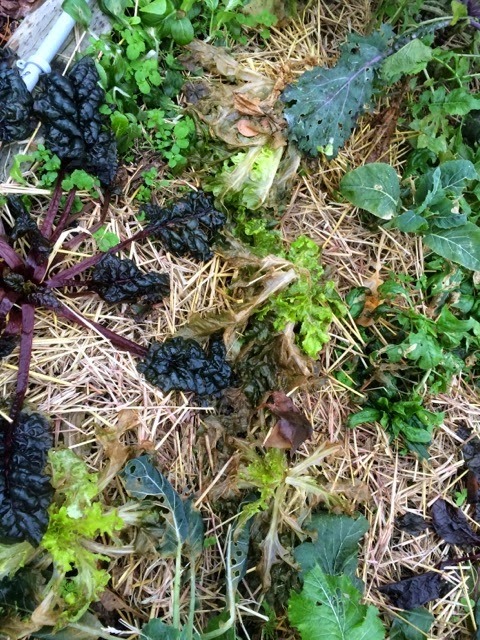 The three varieties of kale can be harvested again (one hidden in photo). As mentioned, the lettuce is pretty much done in, so time to start growing inside with my growing light for some fresh greens. The Asian greens (bok choy and sui choy) looks to be in rough shape but I'm crossing my fingers that they may rebound as it appears to be mostly the outer layers that are damaged. 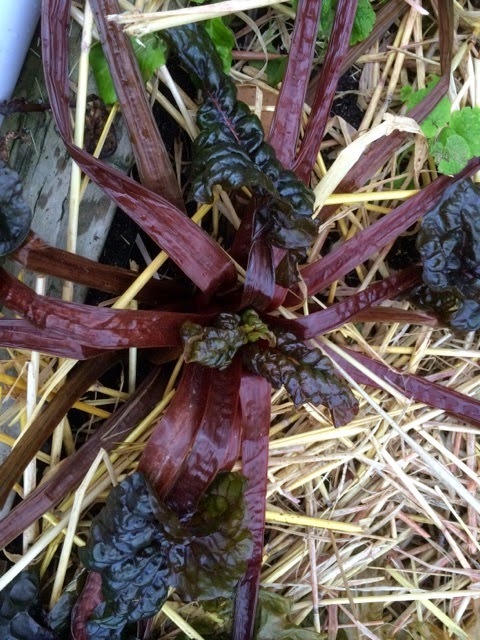 The swiss chard looks inedible, but there is some new growth in the inner centre of the plant. The broccoli and cabbage looks good (I'm growing for an early spring harvest so I'm pleased they haven't been damaged yet). 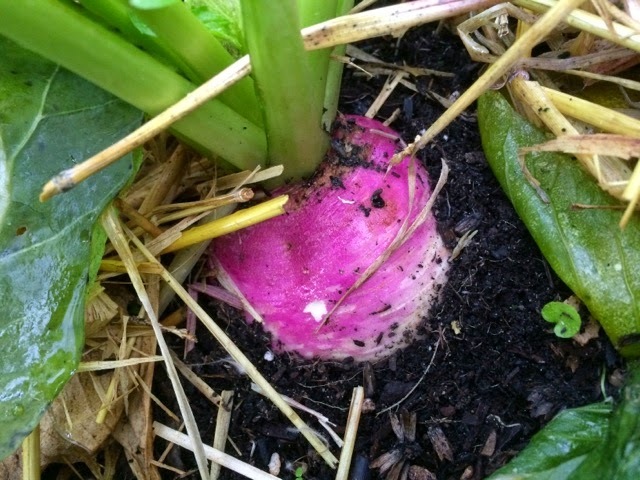 I was most happy when I pulled back the layers of mulch to see big, beautiful purple turnips still happily growing. The real test of the covered tunnels will be when (or if) we get some snow in January and February. My hope is that the tunnels are strong enough to withstand the weight of the wet, slushy snow we get here and protect the kale so that I can harvest fresh greens through the winter. I'm also hoping to use the covered hoops as protection for an early spring garden. I usually try to have my seeds started indoors by February or March and perhaps next year I can transplant the seedlings outdoors earlier than usual. Are Mini Hoop Tunnels Worth The Effort? 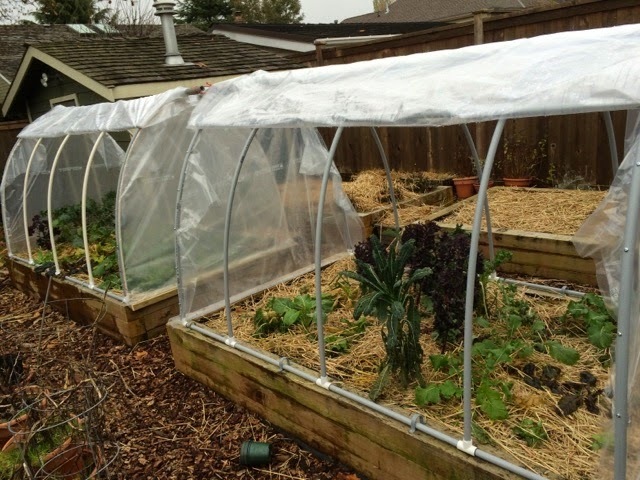 Have you tried covered hoops or cold frames to extend the harvest? Please share your tips. Green Bean looks toward the holidays with a shovel in hand. 1) Sharpened Tools. Every winter, gardeners tuck away their tools - dulled from months worth of snipping and maybe a bit rusted from being left outside in the first rainstorm of the season. Some gardeners are organized enough to have their tools "winterized" - sharpened and cleaned - or do it themselves. For the rest of us, this is an ideal gift! It has no carbon footprint, extends the useful life of our tools and is a service readily available at most locally owned nurseries. You can also bring clippers to almost any knife sharpening service. 2) Seeds or Plants from Your Own Garden. If you have your own garden, what is more thoughtful than carefully saved seeds or propagated plants. Bonus: inexpensive and low impact. 3) Coupon for a Project: Last year, my dad rigged up my bat house in the absolute perfect location (not that the bats have appreciated it yet but someday...). The year before, my husband built me a potato condo. This year, I'm hoping for a raised bed cover for keeping heat in and bugs out. Hint, hint, honey! 4) Coupon for a Work Day: This is a gift even kids can give. What gardener wouldn't welcome a willing pair of hands to spread mulch, turn the compost, pull weeds? 5) New Gloves: Unlike tools which can be refreshed year after year, a well worn pair of garden gloves probably will only last a year or two. 6) A New Fruit Tree: Know your gardener well with this one, but if you have someone who has recently moved, expanded their garden or embarked on the hobby, a new fruit tree might be just the thing. My mother-in-law gave me a lemon tree our first year in our new house. It was the perfect gift as I had been lamenting leave our old lemon tree behind. 7) A Greenhouse: Yes, I said it. They are big and expensive and this might be many gifts rolled into one. My husband gave me a greenhouse a few years ago. It was my birthday present, my Christmas present and our anniversary present and it has changed the way I have gardened every since. My greenhouse! And one of my many rain barrels. 8) A birdbath: I have recently waxed on and on about the importance of birdbaths for the garden. Homemade or second hand (think estate sales or Craigslist) are fine here. If you buy new, emphasize quality. A well made cement birdbath can last generations. One that I got new, I have had for eighteen years. The robins enjoy my eighteen year old birdbath - a gift from my parents for my first garden. 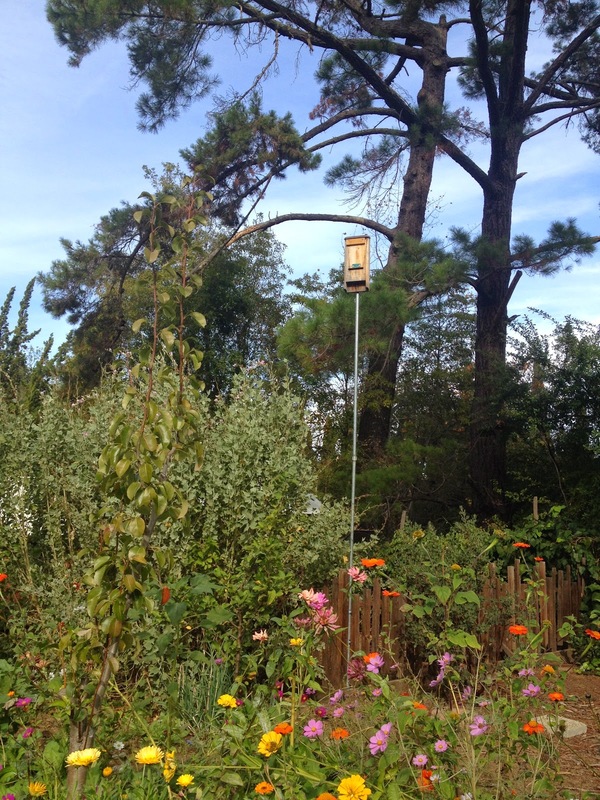 9) A birdhouse: Speaking of birds, who doesn't want more in their garden? They provide beauty and keep pests at bay. Avoid painted birdhouses and look for ones that are plain wood. If you have kids or are crafty, a handmade birdhouse or a birdhouse construction kit is another great option. Birdhouses and birdhouse kits are readily available online, at Home Depot and at birding stores. A woodpecker checking out a birdhouse I picked up at the local thrift store. 10) A rain barrel: Two years ago, I installed my first rain barrel. I am up to five and I cannot believe all the water I was wasting in years past. Rain barrels are wonderful ways to reuse oak wine barrels (Beware, the water will smell like wine. Not necessarily a bad thing!) or food-grade plastic shipping containers. Bonus: in some areas, like my drought-stricken home of California, you can get a rebate for buying a rain barrel. 11) A compost bin: If your gardener does not already have a compost bin set up, I highly recommend one. You can purchase them (sometimes with a rebate from your local garbage company) or you can build one. We currently have one that I hired a handyman to build. I get tons and tons of high quality compost every year from what would otherwise go to the landfill. 12) A Garden Bench or Chair: Your gardener may already have plenty of these but most of us don't. Most of us gardeners are so busy gardening, that we do not take the time to sit down and drink in the beauty and life of our gardens. I have two benches in my main garden and I am still angling for another seat on the other side. 13) Gift certificates to your gardeners' favorite local nursery, seed store or online garden supply store. 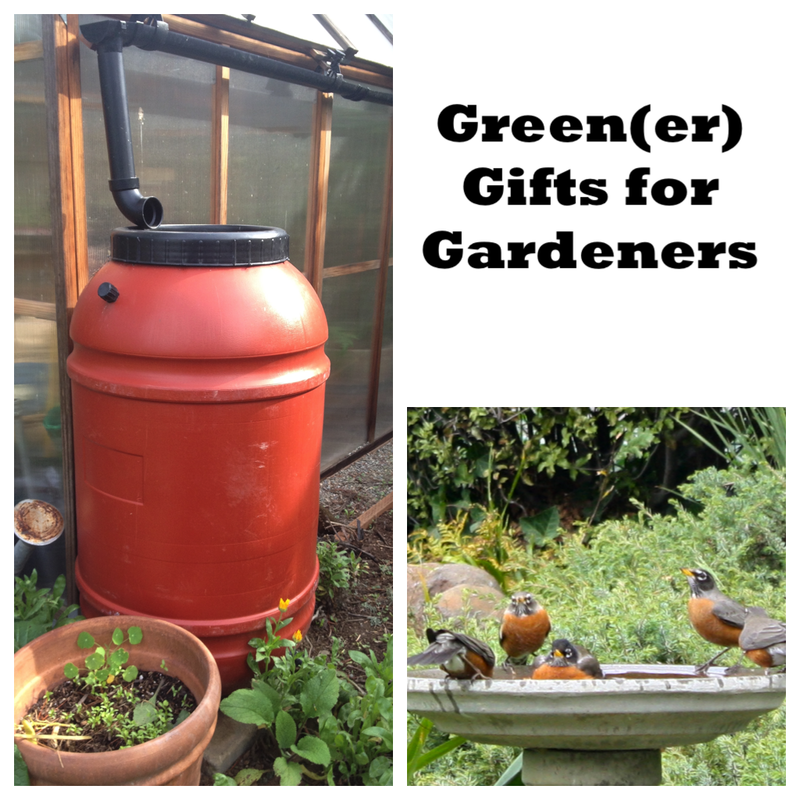 Peaceful Valley Organic Garden Supply is my favorite for all around garden supplies. What other gifts can you add to the list? If you garden, what are you hoping for this year? 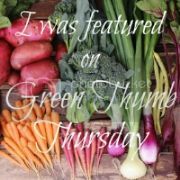 This post is part of the Homestead Barn Hop, Backyard Farming Connection, Maple Hill Hop, and Green Thumb Thursday. I love every season. Truly, I do. But there is just something about fall that makes my soul happy. The crisp air, the gorgeous colors, the spicy smells of cinnamon and clove, the harvest, canning, Halloween, pumpkin everything. Seriously, I could go on and on. 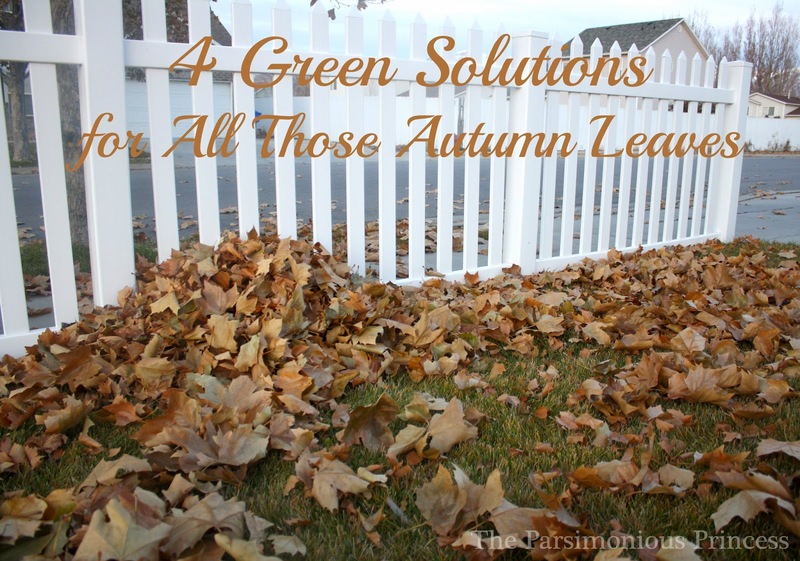 One drawback to autumn for many people is raking and cleaning up all those fallen leaves. Don't get me wrong, having leaves scattered all over the lawn is fun and the love kids playing in them, but eventually you have to face reality and clean them all up. 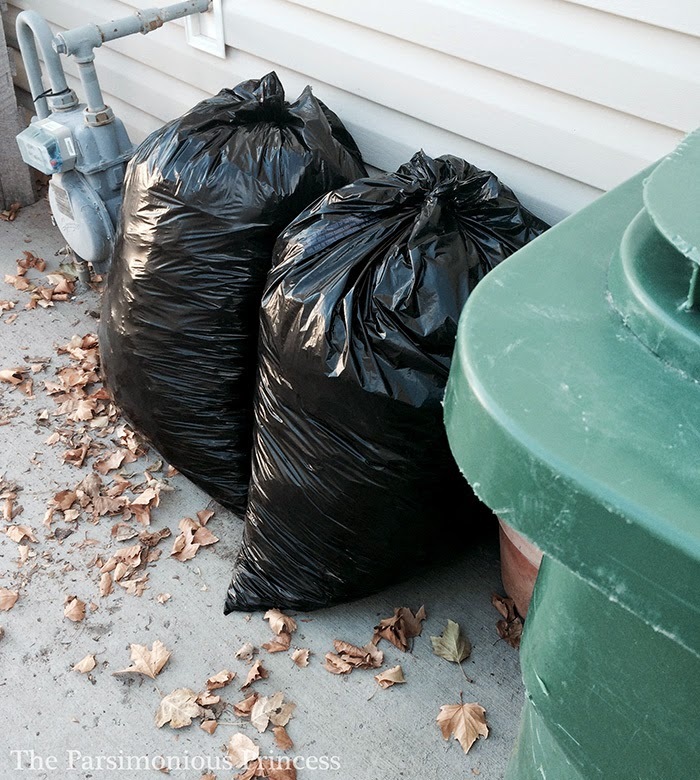 Often, people will rake, bag up all their leaves, and toss them in the garbage. I don't know if it's the gardening geek or the eco-friendly part of me that balks the most at the idea of throwing leaves into the trash. 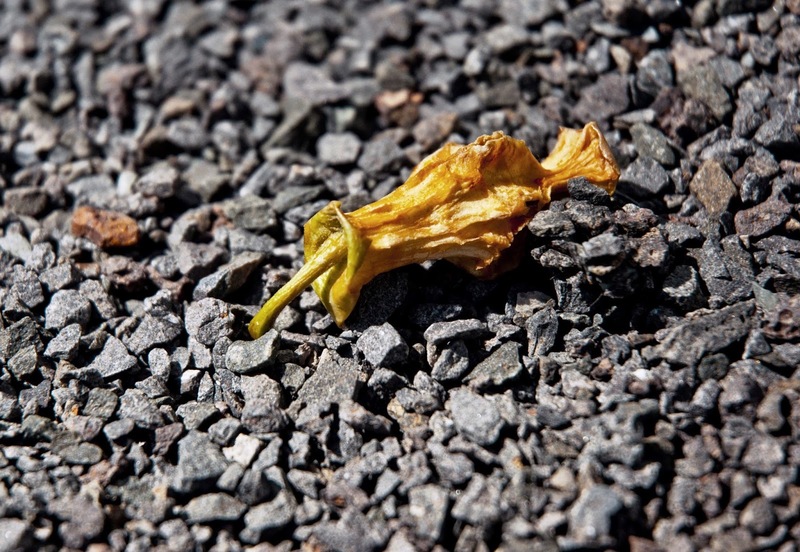 Fallen leaves totally have a second life in your yard and garden! Every fall, my compost bin in the backyard is full of brown leaves. Like, overflowing. But by spring, sure enough, the leaves have broken down a lot under the weight of winter snow. Leaves make for great compost because they're full of trace minerals that the trees have drawn up from the deep soil. 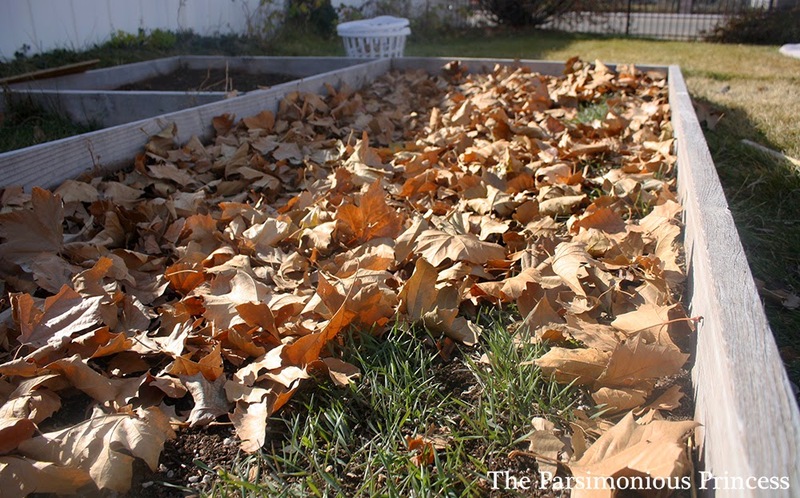 Do you have more leaves than you can fit in your compost bin? Save them for your compost bin later. Seriously, stash a couple bags away for the spring. Without getting into too much composting detail, basically the goal with a good compost is to have a balance between green and brown material so it'll break down. In the fall, it's pretty hard to get that green-brown balance; you're just going to have an excess of brown in autumn. However, if you save some of your leaves, all that brown material will be great for spring and summer time when your compost bin is full of green material from weeding and deadheading, especially since brown material is a little hard to come by in spring and summer. I learned about making leaf mold earlier this year when I read The Edible Garden by Alys Fowler (a fantastic book -- highly recommend it) and I've been so excited to try it ever since. Leaf mold is a really great soil amendment; it's even been called "nature's substitute for peat". The great thing is that leaf mold is super-easy to make: just bag up your leaves in a black garbage bag, poke some holes in the bag, and leave it alone for a year. The moisture that will get into the bag via the holes will get the leaves to rot. I've got my leaves bagged up and next to my garbage can. You can read an article from Alys Fowler for more information about leaf mold here. In the fall, I cover my garden bed with mulch with straw, cover crops, and leaves to protect the soil from the harsh winter elements. Leaves are a great mulch for frugal gardening -- I have to buy seeds for cover crops and I have to buy bales of straw, but autumn leaves are free. As you can see in the picture above, I've got some green cover crop (annual rye) in my garden bed, but most of the mulch I'm using is leaves. Leaves work really well to insulate and protect my garden beds, plus they break down and help my garden later on. 4. Leave them where they fall. This is the easiest solution of all -- no raking, no clean-up! Granted, this doesn't work for the leaves covering your lawn, but it's definitely one you can use for other areas of your yard. 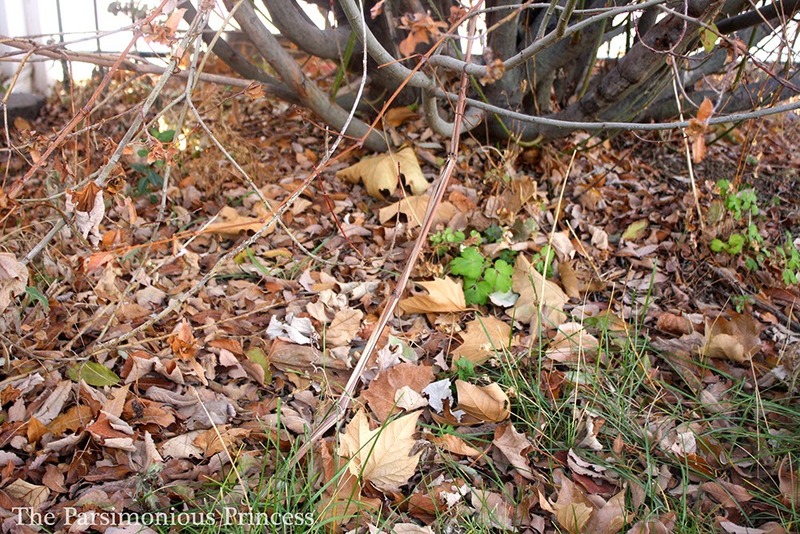 The picture above shows what it looks like under the pussywillow tree in a corner of my yard. I've never rake under that tree. I just let the small leaves break down and work their way into the soil. They also mulch some of the perennials that grow around it. I do the same with my lilac bush in one of my flowerbeds and with the quaking aspen in another corner of my yard. So, yeah, having trees in your yard can mean a mess in the fall, but it's a mess that keeps on giving. Save those leaves from the trash and, instead, put them to work! "You are in luck," the voice said on the other end of the connection. "They don't make the part any more so we will just give you a new washer." I guess it is lucky. 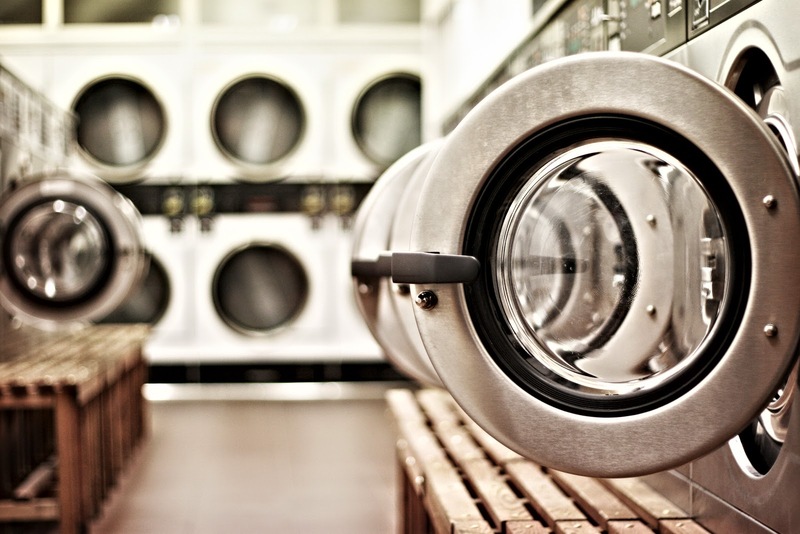 A new washer is better than one that does not work but what happened to repairing products? To replacement parts? To high quality items that would last and last and last? At 4 years old, our washer is not exactly ancient yet, apparently, its manufacturer has left it in the dust - or more appropriately the landfill. It is not just appliances and its not just businesses. Our society as a whole views most things as disposable or transitory. When my iPhone 4's screen cracked, I got it fixed. Everyone and their mother asked why the heck I didn't just get the iPhone 6. I mean, iPhone 4s are so totally two years ago. Visit any thrift store and you will see that our collective lack of interest in repair touches on anything that is broken, torn or stained. Just last month, I picked up an Athleta hoodie that was like new - except the zipper sticks some time. I also scored a white collared shirt with a cracked button. Just as I am ready to throw my hands up, I noticed a gaping hole in my Patagonia parka. I vaguely remembered hearing something about Patagonia repairing their products and gambol about the internet. I find the company repair page, send in my jacket and wait. Ten days later, a package arrives from Patagonia Repair Department. My sassy black jacket is inside, patched up, nearly undetectably, for free! Now that is the art of repair! How regularly do you repair items? Have you ever tried one of those repair clinics that are popular in Europe and showing up more in big cities? Are companies like Patagonia the wave of the future or a denizen of the past? 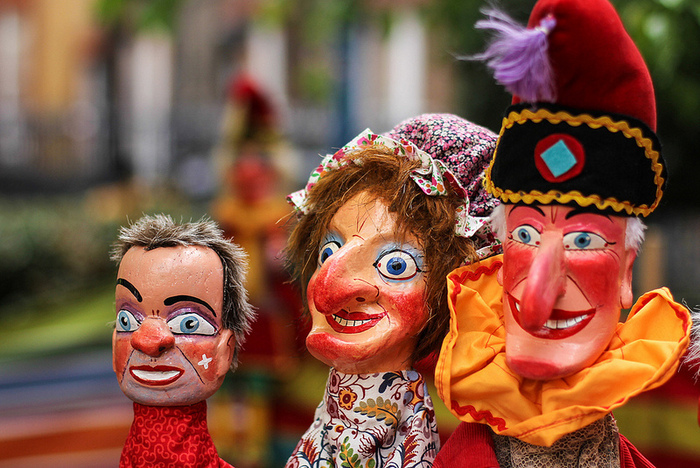 The Climate Crusader is thinking about public displays of environmentalism. "Did you just put that apple core in your reusable bag?" I was sitting in the staff room of the school where I'm volunteering and eating my lunch. The school has recycling for bottles, cans and paper, but no compost and no recycling for other materials (that I have seen). And so, I have been bringing my compostables and recyclables home with me. It's not a lot of effort, and I feel better knowing that my green waste isn't ending up in the landfill where it will create greenhouse gases. On this day, though, someone else noticed what I was doing. I decided that it wasn't a big deal and said that yes, I was bringing my apple core home to compost. The questioner looked surprised and told me that I was very green. I brushed it off, saying that my house has green waste collection so it really isn't all that hard. So why did I feel the need to downplay my actions? One of the things about making visible green choices is that sometimes, other people notice. And when they notice, they have their own reactions and feelings. This is totally fair. Sometimes they respond positively, and talk about the steps they're taking towards sustainability. Sometimes they respond curiously, asking how or why I'm doing what I do. And sometimes they respond defensively, giving me reasons for why they can't do it themselves. In real life, I'm a fairly low-key person. I don't particularly like being noticed. And the handful of times that I've been noticed for doing something green and faced a negative reaction have been pretty uncomfortable. For example, I once blogged about my commitment to drinking tap water (rather than bottled water) whenever possible. A couple of weeks later when I was at someone's house and they offered me a range of beverage options including bottled water I replied, "Plain tap water would be great." This person had read my blog post and said, "Oh, you must think I'm terrible, drinking bottled water." I've been on the other side of this equation, too, meeting people who I think of as super-green in person for the first time. I know that when I'm in their presence I suddenly start thinking about that bag of non-organic chips wrapped in plastic that I just finished, or the shirt I'm wearing that I bought on sale at Target that was presumably manufactured in deplorable conditions overseas. I worry that the person I'm meeting will think less of me because I'm not as green as they are. It's natural, as people, to want others to like us. We don't want to be found lacking. I get it. However, I don't think that worrying about how other people may view our environmentalism, or lack thereof, is all that helpful. I can't speak for every single environmentalist, but speaking purely for myself I can say that when I do something like opt for tap water over bottled water or bring my apple cores home to compost I'm not looking down at people who do things differently. I am not the green police, and I don't want to be. In fact, I'm not sure I would qualify. I'm not perfect - far from it. I'm just doing the best I can, in a way that works for me. If you don't want to carry around your old apple cores, I'm not judging you. And I hope you won't judge me for my shortcomings, either. We don't need to police each other's green living. And we don't need to be afraid to let our green sides show, either.